The arrival of a cold front in Glacier National Park was a mixed blessing of fire-moderating rain showers and fire-feeding winds, the Howe Ridge fire’s incident management team reported Tuesday morning. Now mapped at 11,172 acres, the fire continues to actively advance on its southern and southwestern flanks above Lake McDonald. While the front brought sustained rains to some areas of western Montana, including Missoula, Glacier Park only picked up variable showers, according to park officials. The improved visibility allowed two Canadian “Super Scoopers” and a pair of heavy helicopters to resume water drops on the wildfire. Those flights were grounded over the weekend because of the extremely low visibility caused by smoke from the fire. 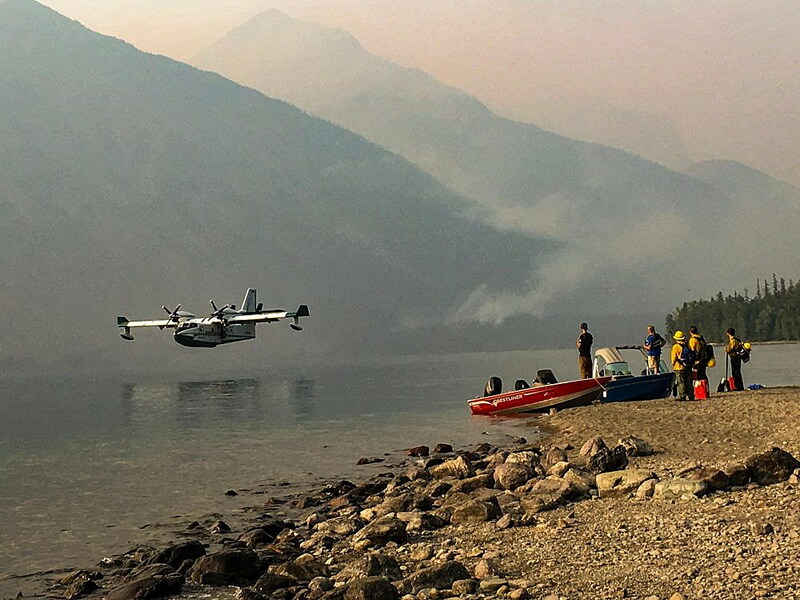 With the fire’s continued aggressive advance, firefighters are installing high-volume pumps and sprinklers at Lake McDonald Lodge, which sits opposite the fire on the lake’s shore. Glacier Park Lodges Inc., the concessionaire that manages the park’s historic wooden lodges, has closed Lake McDonald Lodge for the season – more than a month early. Incident commander John Pierson said firefighters also “will continue to fortify containment lines on the southwest flank of the fire and protect structures at the Fish Creek Campground” – which has been evacuated – as well as structures along North Lake McDonald Road. About a dozen historic cabins and outbuildings on that road burned a day after the Howe Ridge fire was ignited by lightning earlier this month. Pierson’s team does not want the fire to jump the Sun Road, which is about a half-mile from northern flank. Each evening, the fire is fed by down-valley winds that push the flame front south and west into heavy dead fuels left by the 2003 Robert fire. Sprague Creek and Avalanche campgrounds. An evacuation warning from the Quarter Circle Bridge Road north has been issued. This includes Apgar, the Grist Road and all areas accessed from Quarter Circle Bridge Road. In addition, the Sun Road is closed from near Apgar to Logan Pass. The pass is still accessible from Glacier Park’s eastern entrance at St. Mary. Many trails in the fire zone remain closed, including trails off the Camas Road.A complete list of trail closures is on the park’s website: www.nps.gov/glac.